The success of the euro has fueled interest in a plan for global monetary union that could end currency crises and boost world trade. For decades there has been a groundswell of opinion developing in support of a single global currency. With the success of the euro, a project that many observers expected to end in embarrassing and costly failure, the pressure to create a global currency is only increasing. The benefits from a universal currency would be enormous, its proponents say. An estimated $400 billion a year in foreign-exchange transaction costs would be eliminated. There would be no currency fluctuations or currency crises. There would be no need for central banks to hold foreign currency reserves, which hang like a sword of Damocles over the markets as central banks and sovereign wealth funds shift their massive holdings. With a single global currency, prices worldwide would be denominated in the same unit and could be easily compared. Trade between countries would be as simple as interstate commerce in the United States. Global travelers would not have to worry about changing their money and paying fees for this inconvenience. A world currency would lead to an enormous increase in the gains from trade and real incomes of all countries, including the US, says Robert Mundell, a Columbia University economist who won the Nobel Prize in Economics in 1999 for his work on optimum currency areas and his analysis of monetary and fiscal policy under different exchange-rate regimes. “The benefits to each country from a stable currency that is also a universal currency would be enormous,” Mundell says in a posting on his web page. “If the whole world were dollarized, there would be a common inflation rate and similar interest rates, a considerable increase in trade, productivity and financial integration, all of which would produce a considerable increase in economic growth and well-being,” he says. Whether or not a world currency can be achieved in the near future will depend as much on politics as economics, according to Mundell. To avoid the parochial national connotation of the “dollar,” he suggests calling the world unit the “intor,” a contraction of the words “international” and “or,” French for gold. “My ideal and equilibrium solution would be a world currency (but not a single world currency) in which each country would produce its own unit that exchanges at par with the world unit,” Mundell says. A Group of Three open-market committee designated by the board of the International Monetary Fund would determine how many intors produced each year would be consistent with price stability, he says. A somewhat similar currency, the Linden dollar, already exists in a 3-D virtual world on the Internet, known as Second Life, which has its own economy. In September fashion designer Giorgio Armani opened a clothing shop in Second Life. It is a replica of Armani’s flagship store in Milan. The designer sent an avatar, a virtual replica of himself, to open the virtual store in the online world. Residents of Second Life can use Linden dollars to purchase Armani outfits for their own avatars, or they can get connected to Armani’s new online store if they want to buy clothing to wear in real life, for which they will be billed in real money. In Second Life, residents can buy and sell virtual products and services, as well as “real estate,” using Linden dollars, which are exchangeable for US dollars and other currencies on market-based currency exchanges. Originally, all “land” comes from San Francisco-based Linden Lab, the owner of the software and the server that make up Second Life. Bonpasse says that globalization and monetary nationalism are a dangerous combination. “The benefits of a single global currency far outweigh the costs, so we should start planning now and avoid further risk and crises,” he says. The International Monetary Fund, which has a staff of about 2,635 people from 143 countries, should assign 10 economists to begin the long-term project of moving to a single global currency, Bonpasse says. His association’s goal is to have the single currency adopted by 2024, the 80-year anniversary of a United Nations conference convened in Bretton Woods, New Hampshire, in July 1944. The IMF, an organization of 185 countries, was conceived at the conference, which sought to build a framework for economic cooperation to avoid the disastrous beggar-thy-neighbor economic policies that led to the Great Depression of the 1930s. “The world’s existing multi-currency system must be replaced, and the IMF should explore this idea,” Bonpasse says. “The only reason the IMF exists is to help the world cope with floating exchange rates.” He says the $3.2 trillion-a-day market for trading national currencies has become hazardous and can bring down even large economies as these currencies lurch up and down with large, unpredictable variations. The single global currency doesn’t have to wait until all 192 countries in the world want to join, Bonpasse says. “Once about half of the countries sign on, the rest would seek to join very quickly,” he predicts. “Everyone would follow the leader. A universal goal of central banks and the people of the world is to have stable money,” he says. 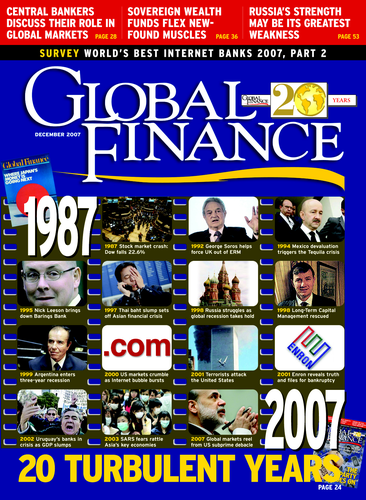 There are several possible routes to the single global currency, according to Bonpasse, including the enlargement of existing monetary unions and the creation of new ones. It is possible that the development of regional currencies similar to the euro in other areas, such as the Association of Southeast Asian Nations (ASEAN) and the Gulf Cooperation Council (GCC), will result in a patchwork of blocs that could link together in the future in a sort of monetary Pangaea, he says. “While regional currencies are preferable to each country having its own currency, the problem is that these regional currencies still have to exist in a multi-currency world,” he explains. Another route would be a global big bang to introduce the new money everywhere on a pre-announced date. The single world currency would require a global central bank to ensure that the global money supply is carefully managed to control inflation, Bonpasse says. “We are now much further down the trip to the single global currency than humans were to the moon in 1962, when President John F. Kennedy proclaimed the goal of the United States to land a human being on the moon by the end of that decade,” Bonpasse says. The euro took nine years and 11 months to implement from the February 1992 signing of the Maastricht Treaty to the January 1, 2002, distribution of the new currency among the people of the eurozone, he says. A huge industry composed of currency traders and analysts, backed up by support staff and technology, has developed since the introduction of floating exchange rates in 1973 under the Basel Accord. “I have a personal interest in having as many currencies as possible,” says David Gilmore, partner and economist at Essex, Connecticut-based Foreign Exchange Analytics. “The notion of a single global currency is seemingly a pipedream. I don’t see it happening,” he says. Today there are at least 147 currencies among the 192 UN member countries. “It is important for national self-interest to have some form of shock absorber to cushion turns in the business cycle,” Gilmore says. “Nations need maximum flexibility.” The lower dollar, for example, helps to offset weakness in the housing market by making US exports more competitive, he says. The single global currency reflects a utopian view of the world, Gilmore says. “In a perfect world, a single currency would make sense, but the political will to create it would have to be enormous,” he says. Meanwhile, it is debatable whether or not the euro has been such a big success, he adds. “The liberalization of economic policies is more a function of politics,” he says. “France, which is running a big trade deficit, can’t get relief on the currency side. There is as much absence of convergence today as in 1999, and the euro faces serious challenges in the future,” he asserts. A single currency would require an optimal currency zone, which the world is not, according to Chandler. “It would require a world government or central authority,” he says. “You can’t get there from here. We are moving in the opposite direction since the Asian financial crisis of 1997 and 1998, with more currencies being decoupled from the dollar and the introduction of greater flexibility,” he explains. Meanwhile, Central European countries such as Slovakia and Hungary are delaying joining the euro, and the United Kingdom is as far away as it has ever been to introducing the continental currency, he says. A gold standard or a commodity standard would be too rigid for a single global currency, Chandler says. It would have to be a fiat currency based on the faith placed in it by the people who use it. A global central bank could provide a well-managed and stable currency that could benefit the people of the world, according to Bonpasse. “Most poor people live in countries with poorly managed currencies,” he says. Once they realize the benefits of a global currency, he says, they will demand it.